The Arctic Ocean is important strategically to the United States because of our border on it and because it is a waterway connecting the Pacific and Atlantic oceans. 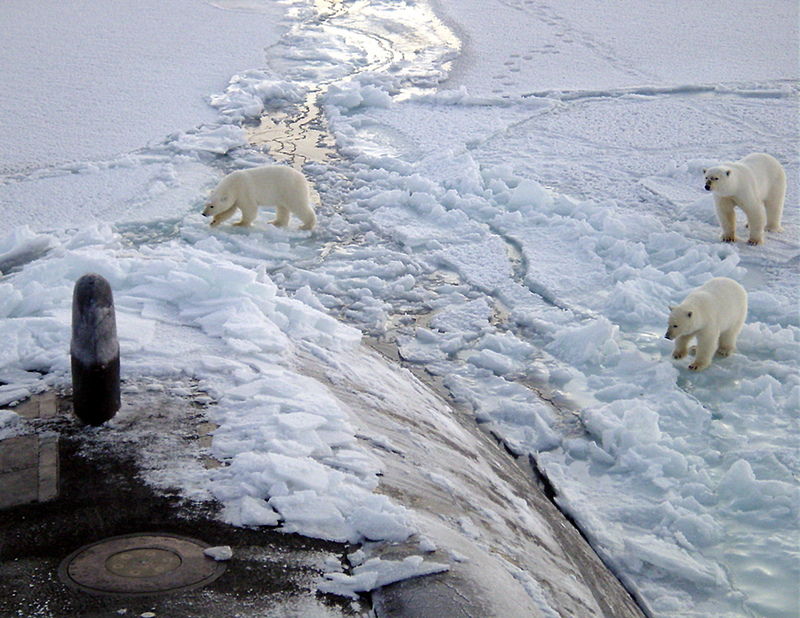 U.S. Navy submarine operations in the Arctic are challenged in many ways by the ice cover. Submarines require access to the surface on occasion—to communicate, visualize the surface, or ventilate the sub. USS Annapolis and USS Helena surfaced several times during ICEX 2009. Bringing submarines to the surface near the ice station, where the camp and aircraft runway depend on a stable piece of ice, required careful planning and coordination between the camp and vessels. Sub surfacing locations were scouted from camp prior to the arrivals of Annapolis and Helena. A large refrozen lead was found to the north of the ice station. With the ice 18″ thick and growing a couple inches of thickness per day, APL-UW engineers forecast the ice would be between 2–3′ thick when the first sub arrived, if it didn’t close or break up. Thinner newer ice is preferred because it allows enough light through that a surfacing target location can be marked in the snow and visualized by the sub’s optical sensors. When Annapolis arrived one day early she surfaced in the refrozen lead and the APL-UW logistics team used chain saws and ice picks to clear the forward hatch. Another large lead of open water was scouted to the west of camp; these conditions were required for the non-ice-hardened Helena. The Navy’s overall goal of under-ice operations testing is to make them safer and more efficient. One system tested is an Ice Keel Avoidance (IKA) sonar, because when cruising at shallow depths, submarines must be able to sense ice keels and icebergs that may protrude into their path. Other communication and navigation challenges were addressed during the exercises at APLIS, but the highest priority was to evaluate how torpedoes behave in an ice-covered environment. Acoustic systems on torpedoes perform differently in the Arctic than in temperate oceans. Sound propagation is affected by several factors in this complex environment—an irregular, reflective surface from the underside of the ice and salinity variations caused by river runoff and ice melt. The tests are used to evaluate and improve torpedoes, their detection capabilities, and their ability to discriminate between a target and the ice.